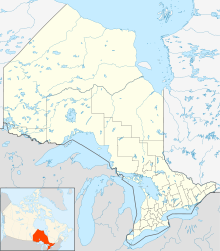 Canadian Forces Base Borden (also CFB Borden, French: Base des Forces canadiennes Borden or BFC Borden), formerly RCAF Station Borden, is a Canadian Forces base located in Ontario. The historic birthplace of the Royal Canadian Air Force, CFB Borden is home to the largest training wing in the Canadian Armed Forces. The base is run by Canadian Forces Support Training Group (CFSTG) and reports to the Canadian Defence Academy (CDA) in Kingston. At the height of the First World War, the Borden Military Camp opened at a location on a glacial moraine west of Barrie in 1916 to train units for the Canadian Expeditionary Force. It was named for Sir Frederick William Borden, former Minister of Militia. In May 1916, the Barrie and Collingwood companies of the 157th Battalion (Simcoe Foresters), CEF (perpetuated today by The Grey and Simcoe Foresters ), under the command of Lieutenant-Colonel D. H. MacLaren, began construction of the camp. Camp Borden was selected in 1917 for a military aerodrome, becoming the first flying station of the Royal Flying Corps Canada. During the inter-war period, the aerodrome was used as the training location for the nascent Royal Canadian Air Force (RCAF) and was renamed RCAF Station Borden. Camp Borden's training grounds were expanded in 1938 to house the Canadian Tank School. The Siskins were a RCAF aerobatic flying team that was established in 1929 at Camp Borden. During the Second World War, both Camp Borden and RCAF Station Borden became the most important training facility in Canada, housing both army training and flight training, the latter under the British Commonwealth Air Training Plan (BCATP). The BCATP's No. 1 Service Flying Training School (SFTS) was located here until 1946. Relief landing fields were located at Alliston and Edenvale. A third landing field, known locally as Leach's Field, was operated by Camp Borden from the 1920s to the 1950s. The L-shaped airstrip was rudimentary; the "runways" at Leach's Field utilized the existing ground surface. It was primarily used for touch-and-go flying. During the Cold War, Borden's importance as an RCAF facility in Ontario declined in favour of CFB Trenton, CFB Uplands and CFB North Bay. However, its use as an army facility stayed consistent until 1970 when a major reorganization of the combat arms' schools resulted in the transfer of the Infantry School and Armoured School to CFB Gagetown in New Brunswick. On the other hand, numerous "purple" (i.e. tri-service) schools were established or expanded from existing service training establishments, including the Canadian Forces School of Administration and Logistics, the School of Aerospace Ordnance Engineering and the Canadian Forces Health Service Training Centre. The February 1, 1968 unification of the RCAF with the Royal Canadian Navy and the Canadian Army resulted in the creation of the Canadian Forces. The military facilities consisting of Camp Borden and RCAF Station Borden were grouped under a new name, Canadian Forces Base Borden (CFB Borden). The aerodrome was closed in 1970 and the base saw use as a regular and reserve training facility for Canadian Forces Land Force Command (the army), as well as hosting various land-based training courses for Canadian Forces Air Command (the air force). In a 1990s reorganization of the Canadian Forces following the end of the Cold War, CFB Borden's air force training facilities were grouped under the name 16 Wing Borden. The eight surviving Royal Flying Corps hangars at the base have been designated a National Historic Site of Canada. The Ontario Heritage Foundation, Ministry of Culture and Recreation erected a plaque in 1976. Camp Borden was established during the First World War as a major training centre of Canadian Expeditionary Force battalions. The Camp (including this structure) was officially opened by Sir Sam Hughes, Minister of Militia and Defence, on July 11, 1916, after two months of intensive building. This military reserve, comprising over twenty square miles, was soon occupied by some 32,000 troops. 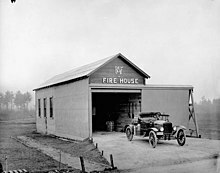 Training facilities were expanded in 1917 with the institution of an air training programme under the Royal Flying Corps, Canada, and the construction of the first Canadian military aerodrome, regarded as the finest military aviation camp in North America. Following the armistice Camp Borden continued as an important army and air force centre and became one of the largest armed forces bases in Canada. 2 Canadian Air Division's (2 Cdn Air Div) primary lodger unit, 16 Wing, commonly referred to as 16 Wing Borden, consists of 16 Wing Headquarters and three schools: Canadian Forces School of Aerospace Technology and Engineering (CFSATE) and Air Command Academy (ACA); and the Canadian Forces School of Aerospace Control (CFSACO), located in Cornwall, Ontario. The Canadian Army's (CA) Regular Force and Primary Reserve army units use a number of training schools and large portions of the base's 22,300 acres (90 km2) training area for manoeuvres. In addition to these specific environmental element commands, CFB Borden houses a variety of other purple trades training facilities and headquarters within the Canadian Forces, including a fire-fighting school, Military Police (MP) school, a chaplaincy school, the Canadian Forces Recruiting Group, medical, dental and language schools, and supports local cadet and reserve units. The Toronto Police Service's Emergency Task Force also trains there occasionally. CFB Borden hosts the Blackdown Cadet Training Centre, a facility established for training army cadets. This facility has also hosted air cadets and sea cadets since 2003, when the Borden Air Cadet Summer Training Centre was closed. CFB Borden's residential area houses one regulation-sized golf course (Circled Pine Golf Course, par 72). Circled Pine Golf Course opened in 1952. The course is open to the public and serving Military. The base previously housed a 9-hole links style course, Anderson Park, which originally opened in 1917 but closed after the 2015 season. Base Borden has multiple facilities available to Canadian Armed Forces members that include the Terra theatre, Circled Pine Bowling Centre, two gyms (Buell Fitness & Aquatic Centre and the sub gym, aka 'the bubble'), multiple soccer fields, baseball diamonds, Andy Anderson arena and biking trails. The Base Borden Military Museum (combining four separate museums) has numerous items, equipment and vehicles from all eras of Canadian military history, including a large number of armoured vehicles and aircraft displayed outside in Worthington Park and around the headquarters area of the base. In 2004 the decision was made to close the remaining runways to all aircraft other than helicopters. Only the taxiway and a small section of runway 05/23 remain today (the rest is covered with grass). A helicopter pad is still active at the base of the former runway. The aircraft control tower is dedicated to the memory of Royal Flying Corps Cadet James Harold Talbot. Talbot became the first fatality at Camp Borden when his Curtiss J.N.4 'Jenny' aeroplane crashed on April 8, 1917. The Air Force Annex of the Base Borden Military Museum is dedicated in memory of First World War Victoria Cross recipient Lieutenant Alan Arnett McLeod, the youngest Canadian airman to receive the award. Worthington Park, a part of the Base Borden Military Museum complex, is named after Major-General F. F. Worthington (Frederic Franklin Worthington), the father of the Royal Canadian Armoured Corps. General Worthington is buried in Worthington Park. Snowbird 10 sporting the 40th season anniversary sticker above the Canadian flag. 431 squadron was in town for the CFB Borden Canadian Forces Day and Air Show. In 2016, CFB Borden organised an air show for the centennial of Royal Canadian Air Force. In 2017, CFB Borden organised an air show for the 150th anniversary of Canada. The Building O-102 at CFB Borden was recognized as a federal heritage building in 1995. Constructed in 1948 to plans prepared in 1945, Building O-102 is associated with the massive construction and modernization program undertaken by the Department of National Defence at the end of WWII. ^ "16 Wing Borden". Royal Canadian Air Force. Retrieved 19 June 2014. ^ a b Royal Flying Corps Hangars. Canadian Register of Historic Places. ^ "DND/CF - Backgrounder - Defence Infrastructure Projects At CFB Borden". Archived from the original on 2011-04-07. Retrieved 2010-08-17. ^ Staff writer (c. 1942). Pilots Handbook of Aerodromes and Seaplane Bases Vol. 1. Royal Canadian Air Force. p. 100. ^ "CFB Borden Aerodrome". Archived from the original on 2012-03-30. ^ a b c Building O-102. Canadian Register of Historic Places. ^ Building P-148 (School). Canadian Register of Historic Places. ^ Barrie Armoury. Canadian Register of Historic Places. ^ Croil Hall (Building A142). Canadian Register of Historic Places. ^ Building A-78. Canadian Register of Historic Places. ^ Building S-136. Canadian Register of Historic Places. ^ Junior Ranks Quarters (Building T-114). Canadian Register of Historic Places. ^ Junior Ranks Quarters (Building T-115). Canadian Register of Historic Places. ^ Building A-74 (Maple Mess). Canadian Register of Historic Places. ^ Building E-108. Canadian Register of Historic Places. ^ Building O-109 (NCO Building). Canadian Register of Historic Places. Wikimedia Commons has media related to CFB Borden. This page was last edited on 19 February 2019, at 23:25 (UTC).